The Cohiba Mini is a rich and real Cuban flavored light-to-medium cigarillo, 3.2” (82mm) long, of 20 ring gauge, and comes in 5 packs of 20 cigars. It is a machine-made cigarillo manufactured by ICT, under license of Habanos SA, like all cigarillos. They are using short-filler tobacco, which grows on plants also located in the Vuelta Abajo region in Cuba, where the Habanos originate from. 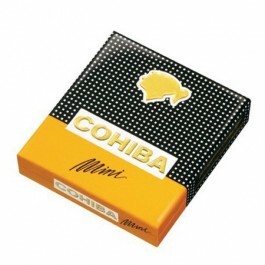 The Cohiba Mini comes pre cut and with no bands. The Cohiba Mini is a very good option for a mild and short smoke. • Mildly spicy, never overpowering. • Real Cuban taste, complex mix of flavors: wood, leather, spices, sweetness. This cigarillo simply provides a very pleasant experience. The Cohiba Mini comes pre cut and with no bands. Its size is similar to a cigarette; the wrapper is rough and bumpy with apparent veins. Aromas of tobacco and spice. The draw on the Cohiba Mini is good, not too loose, not too open. The burn poses no issues. In the second half, the flavors of chocolate fade away and give way to more bitterness of leather and woodiness. In summary, a great mild smoke.